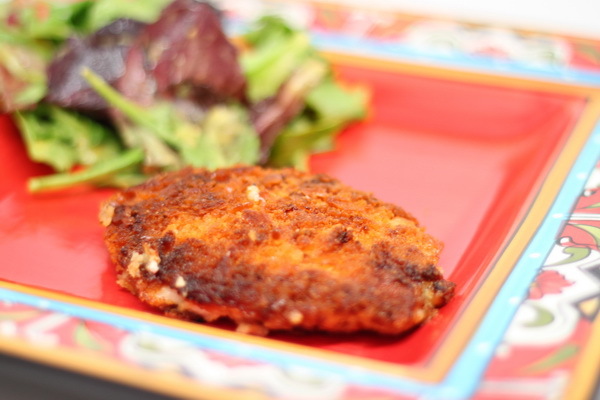 Pork with a great crunchy coating, plus a side salad with a surprisingly good dressing ! 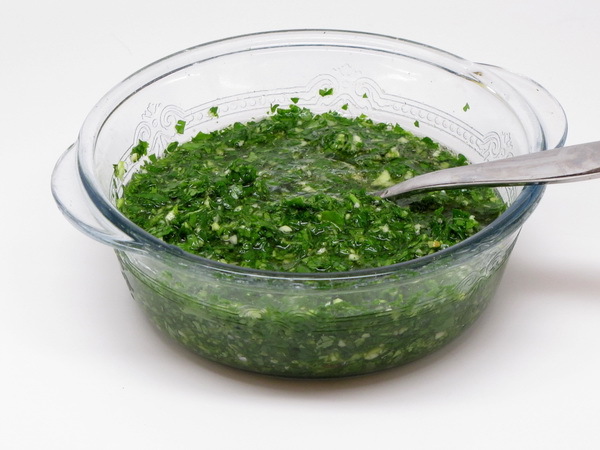 Mix together salsa, mustard and 1 T may0 and set aside – this is the salad dressing. Mix garlic and mayo and coat pork (put it on like you are buttering bread) then coat with the crumbs. Heat skillet and add half the oil. Cook half the chops 5 minutes per side or until done. Add the other oil and repeat with the remaining chops. Mix greens and dressing. 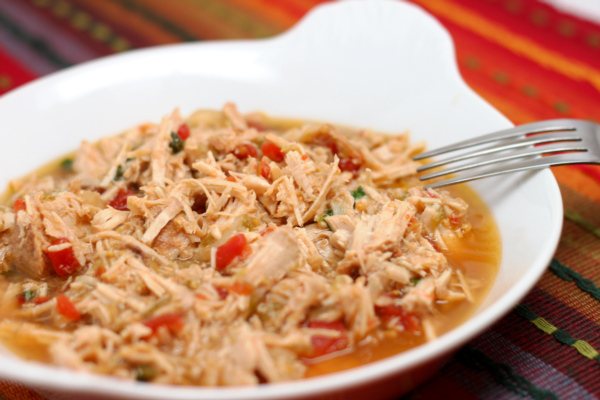 This dish is worthy of any Mexican restaurant out there ! The salsas give the beans a subtle flavor and the velvety consistency of the refried beans is a perfect side to all Mexican fare. Try serving with Mini Chile Rellenos for a great Mexican inspired night. Preheat broiler. 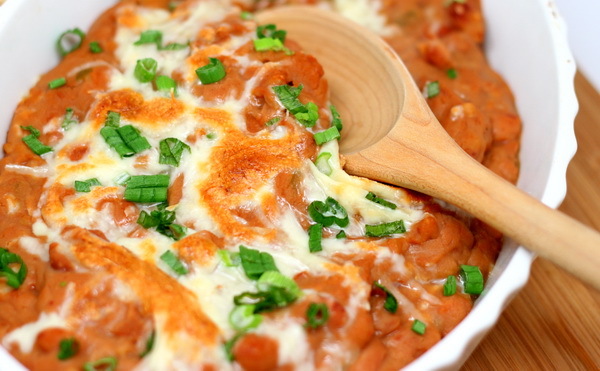 Mix Beans, refried beans, salsas and 1/3 c of cheese in a pan and cook until hot throughout and the cheese has melted. Turn into a casserole dish sprayed with Pam. Sprinkle with the rest of the cheese and the scallions and broil 2 minutes or until cheese is brown. Tomatillos are spicy little green fruits in the tomato family – you have probably eaten them in some salsas (salsa verde which translates to green salsa) and tomatillo sauces. Grilling them brings out a nice sweet flavor. This is a nice spicy addition to a meal that may be a bit on the blander side. Heat grill and oil grates or a grill pan. In a food processor mix the basil, garlic and lemon juice until smooth (adding 1-2 t water if needed). 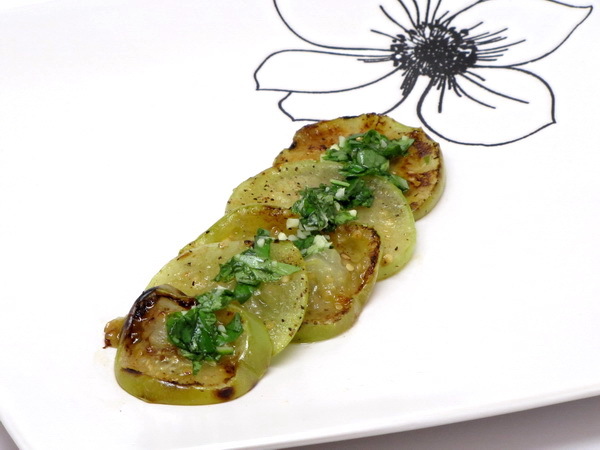 Brush tomatillo slices with oil and season with salt and pepper. 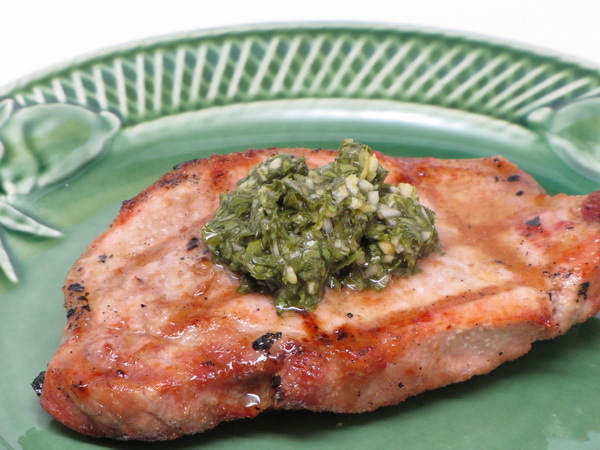 Grill until lightly charred and then serve with basil sauce. 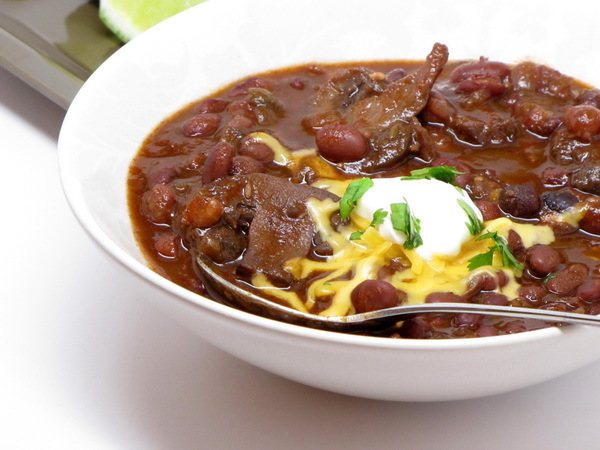 This is so savory and flavorful…and filling ! 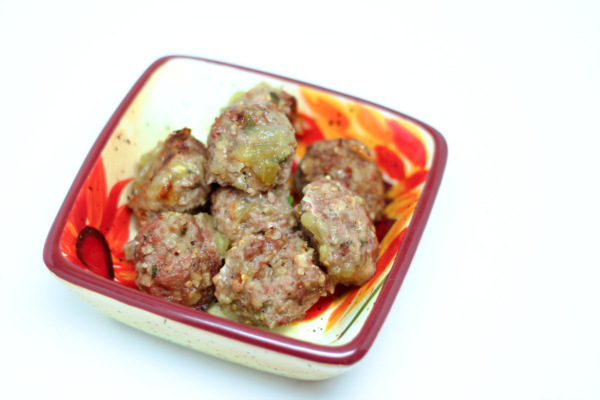 You can also cut these into smaller servings and make as a snack or appetizer. Mix chicken, 1/3 c salsa, salt and pepper. 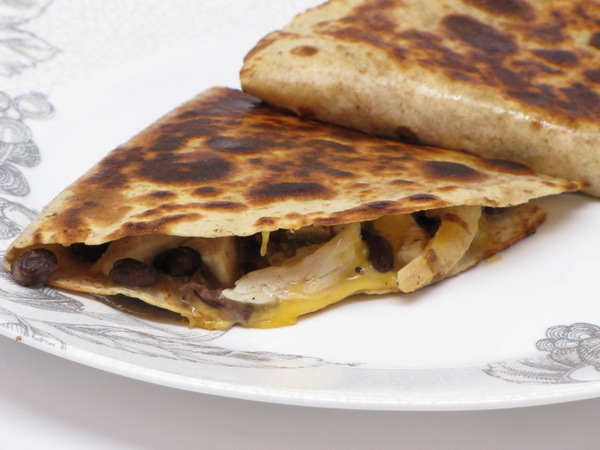 If chicken is cold, you may want to heat it a couple minutes in the microwave – this way the quesadilla comes to heat quicker. Combine beans with the rest of the salsa and mash slightly to break up some of the beans. 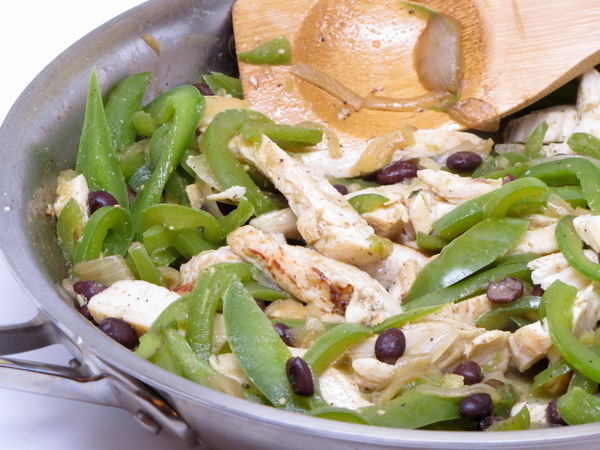 Spread 1/3 bean mix over half a tortilla and then top with ½ of the chicken mix and ¼ c cheese. Fold in half and spray the outsides of the tortillas with Pam. Heat a skillet and cook each quesadilla a couple of minutes each side. Cut into wedges and serve. When I first had this in a Brazilian restaurant I came home and scoured the net to find a recipe that was similar to what I had just tasted. After much trial and error, this is the recipe that grew out of many test batches. When this is paired with meats and fishes, it makes the meal super refreshing and turns the simplest of grilled meats into a flavor sensation – it is soooo good ! But beware – this does leave you with some pretty heavy duty garlic breath – this is not a good recipe for date nite ! Just a tablespoon or 2 served with grilled beef, chicken or fish is a taste treat you won’t soon forget ! Place garlic in a good processor and mince finely. 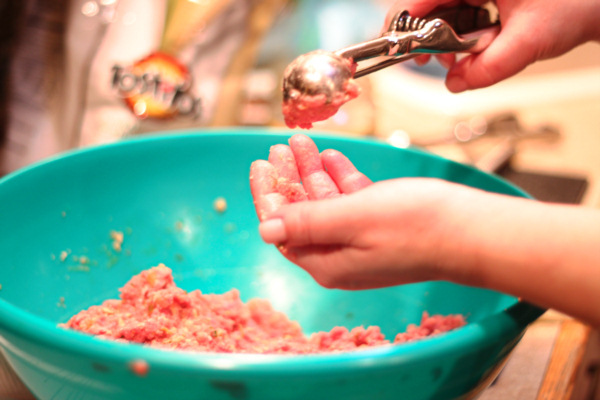 Add parsley and cilantro and mince finely – so fine that the mixture is more of a paste than chopped herbs. Place in a bowl and mix with all the other ingredients. Refrigerate 1 hour to overnight to let the flavors mingle.